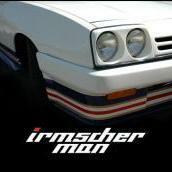 Irmscher Man had the most liked content! Opel / VX / HSV cars, Good Ale and proper music. Great that you have made some progress mate. I had forgotten just how nice that colour is, haven’t seen one for years. Are there another others in the club I wonder? Very rare Irmscher Sport steering wheel, as evo3000 says. Try finding one of them second hand! Just to let you know that the OMOC has purchased this item today for the club supply of panels for remanufacture. It is one of the amazing benefits that we have as a club, as have some funds in the bank and we are using them to stock up on these parts so that we have a future for the cars and the club. Some panels are already in the process of being remanufactured by our provider Expressed Steel Panels. Exciting times ahead! I was thinking Letterbox too, and Herman, your English is brilliant.....Letterbox is exactly the right word. In some European countries it was a requirement for cars to have a headlamp washer system, so the square lamps were the only option. You see a lot of European i200’s with the square lamps. These would usually have the larger square washer bottle. In the UK the washer system wasn’t installed so the small round washer bottle was used instead. The twin headlamps on UK spec i200s were different to the later exclusives in that the Irmscher system has the lamps bolted into a steel cradle and the bezels are removable. 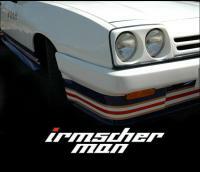 Sorry dude, that is going to end up on the other Irmscher Manta I’ve got lined up. I’ll let you know if I hear of anything though....first shout. That's the problem with parts like this. They are few and far between and lots of people willing to pay top dollar now for those rarer bits. I have been on the look out for a replacement Irmscher Back box for my i200 for (quite literally) over 25 years, that is how rare they are. I managed to pick up a BNIB Irmscher Twin tailpipe rear box a few years ago but I really wanted the original single pipe one for my car. As Evo03 said, you could get one made to exactly the same spec for half the price but without that Irmscher end cap, it is just another aftermarket exhaust.....you may as well buy a Jetex as they are very similar. Getting the tail pipe section from any Irmscher system and having the Coupe box made up is exactly what I was going to do until Carl found this unused one. I used plenty of penetrating oil on them, front and back and kept applying for about a week. Some gentle persuasion with an FBH and they were spinning round like a good un. I will kick things off on here with a Photo I took of the Billing 2013 Car of the Show, owned by Ben Williamson. I am thinking about getting some more calendars made up for 2019, as they sold quite well last year. I will be taking orders for these, so please keep an eye open for the thread on this one, which will be coming soon. In order to get some nice content for the Calendar, If you would like to have your car featured in the 2019 OMOC Calendar, please post a decent resolution picture of your car. Please could you ensure that pictures are at least 300dpi resolution. They will be printed at roughly A4 size on the finished Calendar, so need to be of decent quality. I try to make the Calendar as attractive as possible and I know there are quite a few decent photographers out there so please post up your fave pics. Totally agree and I love the colour. It really suits the Manta Coupe shape and is a bit of a rarity now. I also own a totally original 1979 2.0SRB. I bought it with the intention of doing something similar to the Silver B (pictured) with Twin lights and Big Wheels - and also fit a 16v Redtop on carbs. I went as far as getting all the relevant parts. When I got it home and realised just how original it was, I couldnt bring myself to mess about with it. I took off the hideous Window Louvres from the rear and side and have kept it totally standard for the last 14 years! Totally agree and I love the colour. It really suits the Manta Coupe shape and is a bit of a rarity now. I also own a totally original 1979 2.0SRB. I bought it with the intention of doing something similar to the B with Twin lights and Big Wheels - and also fit a 16v Redtop on carbs When I got it home and realised just how original it was, I couldnt bring myself to mess about with it. I took off the hideous Window Louvres from the rear and side and have kept it totally standard for the last 14 years!